With increased competition and technological advancements, businesses need to be able to deal with change on an ongoing basis. If businesses fail to deal with change, they risk of losing their customers and becoming yesterday's news. This Change Management course will help you play an effective role within an organization that is going through a period of change and adjustment by showing you how to build an effective change strategy. This Change Management course begins by introducing you to organizational structure types and organizational change. You will study the reasons why organizations change as well as how to plan and execute change. You will also learn valuable change management skills and strategies. These will teach you how to overcome resistance and show you why it is important to involve as many co-workers as possible in major change decisions. Going through a major organizational change can be a difficult time for everyone and some may find it difficult to adapt. With this course, you will learn the requirements of a successful organizational change and discover the elements involved in Change Planning. 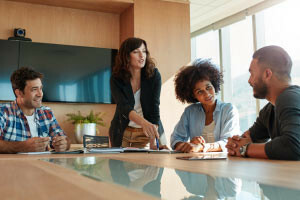 Any business can smoothly pull off change if they have a great change management plan, are open to new perspectives, and address problems professionally. This course will show you how to ensure this happens for your business. This free Change Management course will be of great interest to professionals looking to play a prominent role in change management processes. The course will also be of interest to small business owners who want to learn more about guiding their employees through a period of change. Change is a constant feature of business. This means that the skills you will learn in this course will undoubtedly come in handy sooner or later. So why wait? Start the course now, and become the professional your organization is looking for. Describe the various forms of structure that can exist within an organization. Develop skills that help employees cope throughout periods of change. Discuss the importance of communication, trust and culture in the change management process. Discuss the factors necessary to implement change successfully. Define the various factors that must be in place for an organization to develop a positive capacity for change.